Out of hibernation… | Holly's Footprint.. It has been a quiet few months for Holly’s Footprint since December. We had to take some time away from the project to get through some difficult anniversaries – Christmas, Holly’s Birthday and then the inquest… it was all a bit much. But we’ve managed to come out the other side and it’s time to “get back on the horse” so to speak. We have plans for events over the next few months as well as letting you know about progress for some of the projects we’ve been working on. There are also a couple of upcoming events that people have been kind enough to collect sponsors for on our behalf. First off in January, Holly’s brother, Luke, and his friend Zack Harrap celebrated their 11th birthdays. They had a joint party… a Nerf War… at Hayfield Scout Hut. Both of them very kindly said that instead of presents that they would like people to donate a little money to Holly’s Footprint. They raised £235 from this which was amazing so thank you to all of Zach and Luke’s friends (and their parents of course) for their generosity and the boys themselves for being so thoughtful. We received £64 from Grace Hadfield of Hope Valley College who raised money through selling mini Christmas stockings at the end of last year. Thank you for your hard work Grace… we really appreciate it. Halo Hairdressers in Whaley Bridge where Holly used to get her hair cut had a shopping evening which raised £131 for Holly’s Footprint. Thank you all so much for your kindness and support. Sue Wyatt of Hayfield was moving house and couldn’t take her baby grand piano with her. She first contacted us to see if any of the organisations we were helping had a use for it but unfortunately they didn’t have the room to accommodate it. So it was sold and the proceeds, £300, donated to Holly’s Footprint. Thank you so much for your generosity Sue – we know the piano was an important thing for you with sentimental value. Bridge Insurance in Manchester have a raffle every Christmas with the proceeds split between several nominated charitable organisations. This year our friend, Cath Moss, who works for Bridge got to choose one of the beneficiaries and she put our name forward and gave us a cheque for £225. Not one but two students from Hope Valley College took the plunge to become “folically challenged” for the benefit of the Richard Hill Fund and Holly’s Footprint. First Ben Dean (above) had his hair removed – by a professional I might add (don’t try this at home kids) – raising £200 for us. 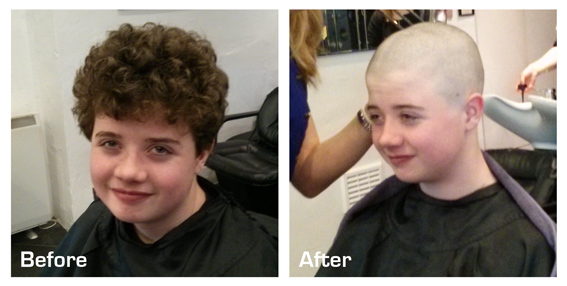 Then just last week we had a message from Jacob Foxley who had also taken to the razor to raise money, bringing in £375. Thank you both, and of course the people who sponsored you, for your very generous and slightly loopy efforts in helping us out – we are very, very grateful. And that is not all but I’ll have to thank them in a subsequent post. ‹ Thank you for the music!